What is the future of knowledge sharing amidst the rise of fake news? Quora does not seem any special when Adam D’Angelo left Facebook as the CTO in 2008 to build the Q&A expert community social media platform in 2009. But what differentiates Quora from Yahoo Answers and other Q&A user-generated content (UGC) sites are the influential experts who answer questions on Quora and the authenticity of answers. Quora went on to attract over 200 million monthly active users and command a valuation of US$1.8 billion. Zhihu 知乎, the Chinese Quora founded by Zhou Yuan 周源, Li Shenshen 李申申 and Huang Jixin 黄继新, is valued at US$2.5 billion. Different from most social media platforms where posting a lot regularly is the norm, one piece of high-quality content on Quora/Zhihu can yield long-tail results, thus becoming a powerful marketing tool and platform to establish long-term trust. However, both Quora and Zhihu are estimated by research firm Owler to generate less than US$20 million in revenue and remain loss-making. What would be the value of an Asian Quora/Zhihu specialized community platform that generates higher recurring revenue with healthy profitability of operating margin of 16.9% (1Q FY09/2019 margin 22.8%), positive free cashflow margin of 13.4%, ROE (= EBIT/ Equity) of 28.5%, ROA of 21.4% and boosted by big data and artificial intelligence to create new innovative categories of growth? This week, we highlight the under-the-radar listed Asian exponential innovator MedPeer (TSE: 6095) who is Japan’s leading integrated medical care and healthcare community platform that aggregates doctors’ knowledge and user-generated content and drug reviews as collective medical intelligence and generates revenue from pharmaceutical companies and other corporate clients. MedPeer operates two key businesses, Doctor Platform and Healthcare Solutions. 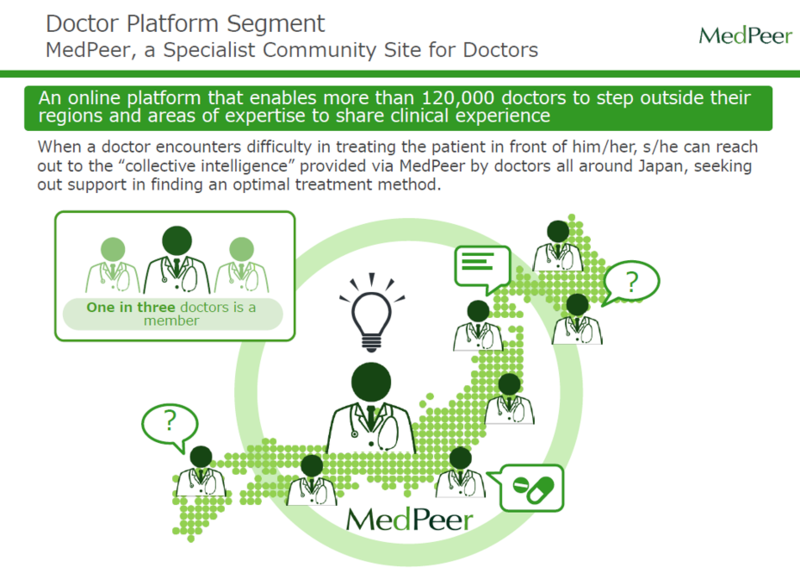 MedPeer is a specialist community social media platform (https://medpeer.jp) with over 120,000 member doctors (66,000 in March 2014), or 40% of Japan’s 300,000 physicians, which provides support with medical collective intelligence content in which member doctors share clinical experience (members can post and read posts for free) and online reviews of drugs (first of its kind launched in spring 2010). It is also a knowledge management tool for sharing live information from doctors on the ground. When a doctor encounters difficulty in treating the patient, he or she can reach out to the “collective intelligence” provided via MedPeer by doctors all around Japan, seeking out support in finding an optimal treatment method. MedPeer generates revenue from over 60 major pharmaceutical client companies (e.g. Takeda Pharmaceutical, Pfizer Japan, Otsuka Pharmaceutical, Sanofi, GSK) and medical device manufacturers by offering access to the accumulated collective medical intelligence information who provide fees in ad placement and by leveraging its collective medical intelligence information to provide extensive marketing support for pharmaceutical companies in their planning, execution and management of marketing strategies. MedPeer generates additional revenue by referring MedPeer member doctors to physician placement agencies. 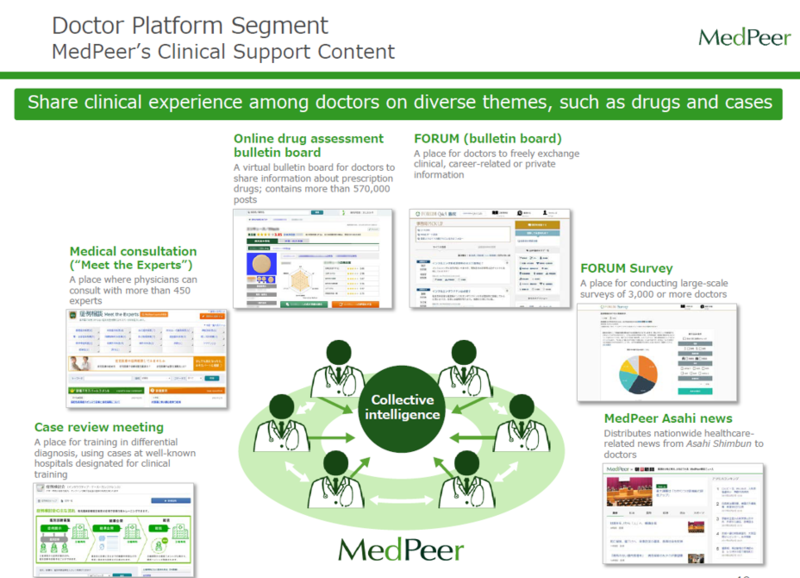 The MedPeer Doctor Platform includes services such as: (1) an online drug assessment bulletin board for doctors to share information about prescription drugs and contains more than 570,000 posts (293,000 in March 2014) covering about 370 medical areas and 2,700 types of drugs (over 90% of the medicine prescribed in Japan in terms of sales is covered); (2) Q&A Forum; (3) medical consultations (“Meet the Experts”); (4) MedPeer Asahi news (jointly managed with Asahi Shimbun since Feb 2005); (5) research services & Forum Survey; (6) case review meeting; and (7) job-hunting information service for doctors (“MedPeer Career”; https://career.medpeer.jp). MedPeer is enjoying recurring and rising demand because the pharmaceutical industry is seeing a shift in drug marketing models, from extensive detailing activities by MRs (marketing representatives) to new models leveraging the internet (e-marketing). Doctors spend 39% of their information-gathering time online (compared to 17% with MRs), yet pharmaceutical companies spend some 1.5 trillion yen on MR-related expenses. This is about 91% of total marketing costs, compared to only about 2% or 40 billion yen that is used for internet-related marketing. Importantly, Japan’s Pharmaceuticals Fair Trade Association and the Japan Pharmaceutical Industries Association have tightened regulations regarding admission and visits to doctors by MRs when promoting their products which includes all information provision, collection, communication and entertainment activities to ensure transparency regarding the money transfer from pharmaceutical companies to doctors. Under these circumstances, doctors are required to efficiently collect useful information about medicines without relying on MRs.
(1) Mediplat Inc (51%-owned subsidiary) operates the online healthcare consultation platform “First Call” (https://www.firstcall.md) which was first launched in Feb 2016 and has established since April 2018 a joint venture with Sugi Holdings (TSE: 7649), a leading pharmaceutical retail chain with a network of over 1,000 pharmacies, 6.8 million point members and 4 million app members and a market value of US$2.8bn. MedPeer and subsidiary Mediplat issued new shares through third-party allotment to Sugi Holdings and Sugi Pharmacy (issue price of 352m yen and 350m yen respectively) effective April 2, 2018. As a result, Sugi Holdings possesses 3.0% of the company’s issued shares, and Sugi Pharmacy holds 49.0% of Mediplat’s issued shares. “First Call” provides healthcare services for companies and health insurance societies on a recurring revenue annual basis, which include online industrial physician service (launched in July 2018) through which patients can connect with doctors via video calls or instant messaging, and an app-based stress-check service (launched in Feb 2019), completing the health and labor management solution to meet the sharp rise in demand for health and labor management solutions ahead of the work style reform law taking effect in spring 2019. Businesses with 50 or more employees are required by law to have a contract with an industrial physician, but compliance rates have been low. Following the suicide of an overworked Dentsu employee, the government stepped up its enforcement, requiring companies to record consultation logs in addition to having a contract with an industrial physician. MedPeer offers conventional referrals of industrial physicians, and provides online peer support to companies that already have contracts with industrial physicians. Consultations that do not require the professional skills of an industrial physician are referred to the chat-based medical consultation service (chats or video calls with physicians of relevant specialty). Companies that use the service together with the online industrial physician service benefit from a one-stop service that includes everything from an online stress check to an interview-based guidance from a doctor. The stress check system was established as a way to prevent workers’ mental health problems after the revised Industrial Safety and Health Act went into effect in December 2015, making it a legal requirement for businesses with 50 or more employees to conduct stress checks on all employees. Scheduling has become a constraint since industrial physicians only visit these companies on certain days. Bringing these consultations online generates benefits, such as enabling appointments on days other than designated visitation dates and allowing individuals to make their own arrangements with industrial physicians. At the end of Q1 FY09/2019, MedPeer had 178 ‘First Call’ clients, up 2.7X yoy from 66 (120 at end of FY09/2018 and over 200 as at end of Feb 2019) and provides medical consultations via chat or video calls to over 150,000 people. From 12 Nov 2018, Mediplat collaborated with Sugi to offer the self-care service ‘Sugi Support’ that utilizes Sugi Pharmacy’s store network and other partner companies’ points of contact with customers. (2) FitsPlus Inc (100% subsidiary) which operates nutritionist platform “DietPlus” (https://dietplus.jp), a business acquired from Cookpad (TSE: 2193) for 227m yen (US$2m) in Oct 2016. 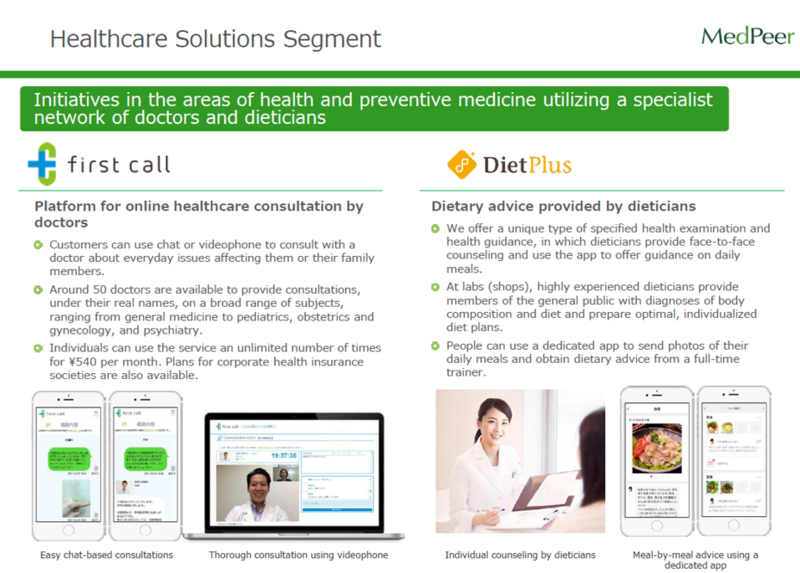 DietPlus provides dietary coordination service provided by a network of over 1,500 certified dietitians that includes specific health guidance provided by dietitians either in-person or through a smartphone app; media services with specialized diet-related content; and specified health examination and health guidance service for health insurance societies. 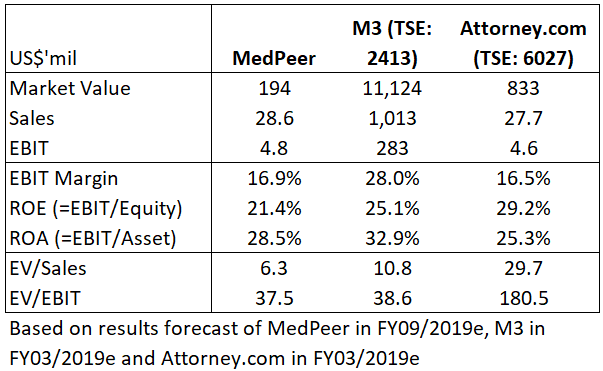 As at 1Q FY09/2019, MedPeer grew the business 1.5X yoy (4,054 cases versus 2,639 in Q1 FY09/2018). MedPeer is building a service platform based on Sugi Support Deli (meal delivery), Sugi Support Eats (dietary records), and Sugi Support Walk (pedometer), and the service was launched in March 2019. The core target is the 200 million visitors to Sugi Pharmacy stores each year, who will be offered a variety of preventive health services. MedPeer aims to generate earnings through the Sugi Support Walk and Sugi Support Eats apps in collaboration with companies with individual customers by offering pedometers and dietary advice. (3) medpass Inc (49%-owned affiliate; https://medpass.co.jp/service), established in June 2016 as a JV with NTT DOCOMO’s Nihon Ultmarc to provide verification services for physicians and other medical professionals. MedPeer is currently the only company operating in both the medical care treatment and healthcare (health promotion, disease prevention, pre-symptomatic care, care during onset, and therapeutic care) fields through all of the stages of a patient. In contrast to competing websites such as M3 (TSE: 2413; 270,000+ member doctors) and Carenet (TSE: 2150) that mainly use and communicate information provided by pharmaceutical companies and other suppliers, MedPeer has distinguished itself as a social media site and a knowledge management tool based on information provided by physician users. The value of the MedPeer website content grows as the number of active users increases. The DAU (Daily Active User) figure for March 2018 was 1.3x the figure at end-March 2017, creating a positive cycle of user generated content (UGC), in which increases in content make the service more attractive and therefore lead to growth in the number of visitors, which in turn results in more content. 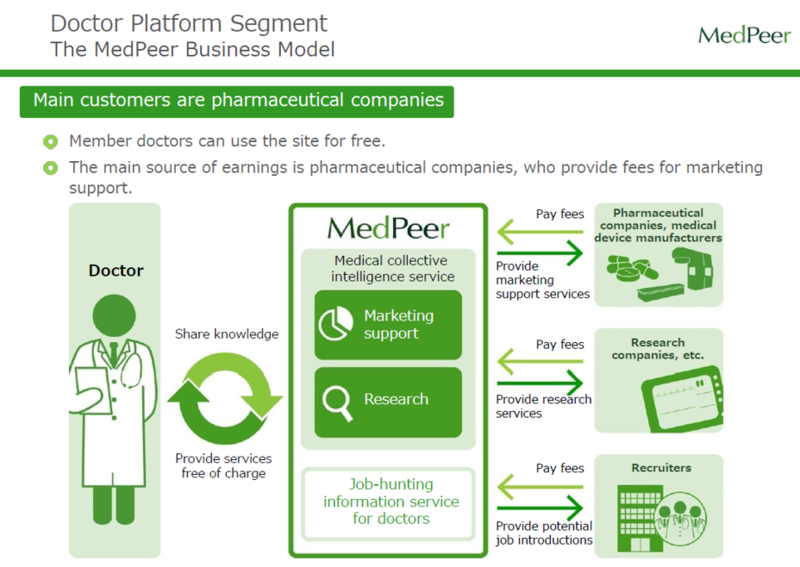 By being the first and only company to offer platforms covering both the health and medical fields, MedPeer can expand its customer base from pharmaceutical companies to health insurance societies, companies, and consumers, as well as benefit from being the first to offer linked services. MedPeer considers medical big data generated by each business segment as its core asset and plans to strengthen its business and services by effective utilization of these asset. MedPeer seeks to create new value and make a profit in the process by the synergy effect of lifelogs (medical and nutrition consultation data and diet/exercise data), PHRs (personal health records), offline data (prescription and dosage data), and its collective medical intelligence (reviews of drugs by physicians and clinical consultation data). By utilizing accumulated data, such as analyzing them using AI, MedPeer plans to launch several preventive healthcare services. The most difficult thing in the Internet era is to create a well-used and valuable community. And the winners who have achieved that are companies with tremendous power to expand the services provided to users. After a difficult initial five years since its 2014 listing, MedPeer has overcome a difficult stage and is at the tipping point for exponential growth. With the community, circumspection and compellingness exponential edge, MedPeer’s business model generates stable and recurring revenue, achieving a 229% and 831% absolute increase in sales and operating profit in the recent three years and generates healthy profitability with operating margin of 16.9% (1Q FY09/2019 margin 22.8%), positive free cashflow margin 13.4%, ROE (= EBIT/ Equity) 28.5%, ROA of 21.4%, propelling a 18% increase in market value from its split-adjusted IPO price of 2,000 yen in June 2014 to US$194m. On 13 Feb, MedPeer announced its 1Q FY09/2019 (Oct-Dec 2018) in which sales increased 39.3% yoy to 762m yen and operating profit rose 89.1% yoy to 174m yen. Balance sheet is relatively healthy with net cash of 1.48bn yen (US$13.2m; of which 640m yen or US$5.7m was raised during its IPO) which is around 6.6% of market cap. MedPeer’s FY09/2019 forecast is sales of 3.2bn yen (+45.5% YoY) and operating profit of 540m yen (+46.8% YoY). On 10 April 10, 2019, MedPeer announced a two-for-one stock split of its common stock, with the effective data on 1 July 2019. Bengo4.com (TSE: 6027). which provides online legal consulting services with a community of 170,000 registered lawyers and generates approximately similar revenue and operating profit to MedPeer (FY03/2019 sales 3.1bn yen and OP 510m yen), has a market value 4.3X of MedPeer at US$833m. Quora, the Q&A expert community website with an estimated revenue of US$8m and over 200m monthly active users (MAU), has a valuation of US$1.8bn. To grow the Doctor Platform, MedPeer intends to make its currently “helpful” services “indispensable” to doctors in their clinical practices and research through: (1) Expansion of the MedPeer member base; (2) Transition from ad delivery platform to marketing platform; (3) Content production; (4) Vertical and horizontal rollout of collective medical intelligence platform. MedPeer plans to form alliances with academic societies, university medical offices, and companies (such as medical publishers and research and recruitment companies) with a member base of physicians. On 11 Jan 2019, MedPeer formed an alliance with Minkore!, which is used by half of the candidates for the National Medical Practitioners Qualifying Examination, to grow its membership among young doctors and medical students, acquiring members at the onset of their careers. The younger generation appreciates the convenience of online services. MedPeer provided solutions to academic societies with large memberships and focused on strategies that could drive step changes in member numbers. On 7 Nov 2018, MedPeer has entered into a business partnership with Intage Holding’s (TSE: 4326) Anterio (https://www.intage-healthcare.co.jp) and Plamed (https://plamed.com). Anterio develops marketing research support business in the medical and healthcare area for pharmaceuticals, medical devices and health food companies. Plamed conducts surveys commissioned by affiliates such as Intage Group and operates a membership website of physicians who are major survey monitors. This business alliance with Intage enables MedPeer to expand its membership base of doctors and provide information to more physicians, and provide consistent support from strategies in the marketing process to communication and verification of drug effectiveness. MedPeer originally operated a doctors-only community website and engaged in content delivery and was not focused on formulating strategy, producing content, creating research questions, or winning projects. MedPeer is strengthening its transition from an ad delivery platform to marketing platform with content production and research capabilities. MedPeer will cover the whole value chain of pharmaceutical marketing by setting up a new content production team and developing new services through alliances with Anterio and Plamed. It will provide an integrated marketing support service covering strategy formulation to content production, content distribution, assessment of effectiveness, and improvement. Anterio and Plamed excel in drawing out potential needs through research. Combining the functions of the three companies allows MedPeer to offer an integrated service. Previously, all processes were performed by separate companies; for example, one company would discover ideas for MedPeer, and another company would produce the content for MedPeer to deliver. Although MedPeer, Anterio, and Plamed have some overlap and compete with each other, they also have complementary strengths and weaknesses. MedPeer believes that being able to offer an integrated service like its competitors will help it win marketing support contracts with pharmaceutical companies and other clients. Major pharmaceutical companies also prefer integrated services. MedPeer plans to fully utilize its own unique data, including review data, articles posted by members, and influencer information (doctors who are next-generation KOLs or key opinion leaders). 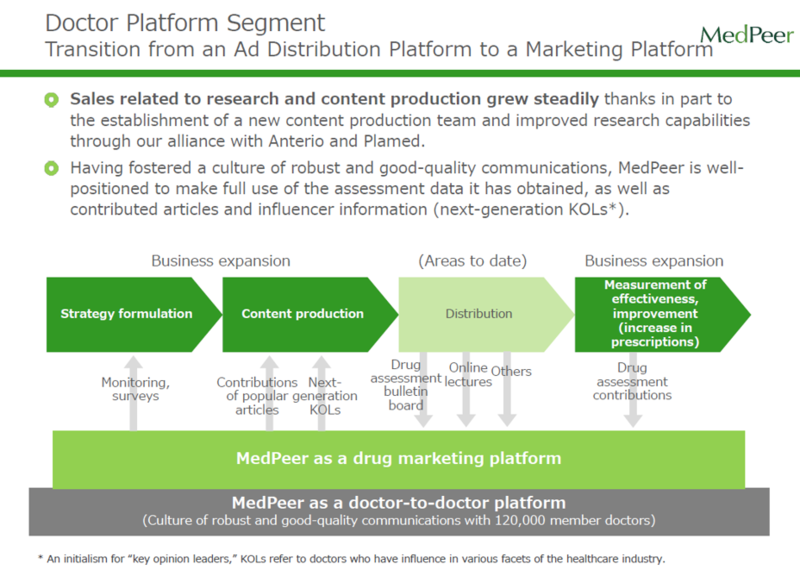 Instead of simply broadcasting a program like on television, MedPeer will also measure the effectiveness of its marketing activities (by establishing a metric that quantifies customer loyalty, observing changes in doctors’ prescribing behaviors through the drug assessment bulletin board), and use the information to adjust strategies. Main content includes webinar plans and web pages containing information such as doctor interviews and disease information that pharmaceutical company ads on the MedPeer site link to. Before forming the alliance with Anterio and Plamed, MedPeer was not involved in producing content linked to by pharmaceutical company ads, but it plans to engage in content production going forward. MedPeer is confident that it can create content that is understandable and easy to view, thanks to the expertise it gained from its website on how to achieve high click rates by adjusting ad presentation (format and wording). MedPeer is developing the collective medical intelligence platform service by launching support services for business launches and management with YakuMed, a platform for pharmacists. MedPeer has recently launched “Clinic Support” (https://clinic.medpeer.jp), a collective medical intelligence platform for doctors wanting to open their own clinics, with “satisfactory” initial results in terms of Q&A services, content delivery, and registration numbers for matching services. MedPeer is evaluating on the right steps before charging fees and generating earnings. MedPeer plans to launch YakuMed, a platform for pharmacists to solve problems and challenges they face on the job, in spring 2019. The platform will feature a drug review sharing service (the MedPeer drug assessment bulletin board for doctors adapted for pharmacists) and discussion forums for pharmacists. Alliance partner Sugi Pharmacy constantly has 3,000–4,000 pharmacists on duty, from whom MedPeer can always access live reviews. Doctors’ drug reviews on the MedPeer site are useful and of great interest to pharmacists. Physicians and pharmacists perceive drugs differently. Although doctors evaluate compliance benchmarks like daily dose frequency (taking a drug once a day is easier to continue than three times a day) and dosage form (size of tablet or pill, powdered medicine is not easy to swallow), pharmacists have a more in-depth understanding of compliance issues. Due to their daily experience handling pharmaceutical products, pharmacists will also provide collective intelligence from perspectives that are different from those of doctors regarding topics such as which generic drugs are easier to remove from bulk packaging. MedPeer believes the pharmacist platform has potential as a marketing business, considering that pharmacists control which generics are dispensed as the government pushes to increase their use. MedPeer is also planning a platform providing support when dispensing pharmacies transition into “family pharmacies” with an app service that connects patients directly with pharmacies to expand their roles in patient–customer relationship management and patient medication support. A family pharmacy keeps comprehensive information on a patient’s prescription and OTC drug usage and supports the health management of local residents by providing professional pharmaceutical skills and services, such as 24-hour service, home visits and periodic checks on whether patients have any leftover or duplicate medications, or are experiencing side effects. The government has been promoting the separation of medical practice and dispensing so that doctors and pharmacists can separate their functions while maximizing their professional knowledge and skills, thereby improving the quality of medical care. Under these conditions, problems have arisen in recent years due to the increase in “monzen pharmacies” which are dispensing pharmacies located near hospitals. Patients attending a hospital will usually have their drugs dispensed at a nearby pharmacy (rather than one near their home). As a result, pharmacies do not have a full record of each patient’s medications, while patients suffer an increase in medical fees and must go to different pharmacies to have their drugs dispensed. The government formulated a “Pharmacies for Patients” vision to address this problem in October 2015, pushing dispensing pharmacies to enhance their roles to transition to become family pharmacies. Pharmacies must shift their priority from dealing with goods (dispensing) to dealing with people (such as providing advice and instructions on how to take medication) to attract patients as family pharmacies. This means that dispensing pharmacists must improve their professional knowledge and communication skills. The majority of dispensing pharmacies are small or owner-operated businesses that are not equipped financially or trained to undertake the new role required of pharmacies. Thus, many pharmacies and pharmacists are struggling to cope with the challenge of taking on new functions and providing new value. On 7 Jan 2019, MedPeer entered into an alliance with EM Systems (TSE: 4820) to link its services such as its drug assessment bulletin board to EM Systems’ medical and dispensing systems provided to clinics and pharmacies. The aim is to expand service range and increase membership among doctors and pharmacists. EM Systems has the leading market share (32% in Japan) in dispensing systems for pharmacies, so MedPeer will display reviews from its drug assessment bulletin board (570,000 posts in aggregate) to link their services. The bulletin board was previously provided only for doctors, but by expanding this to include pharmacists, MedPeer hopes to engender changes from the viewpoint of generating earnings and service value. The government’s focus on specified health guidance has provided a tailwind for MedPeer’s Healthcare Solutions business. The government has been urgently implementing initiatives, such as increasing the rate at which it collects healthcare support money for senior citizens aged over 75. Deregulation has also simplified the procedures for providing online specified health guidance, which was traditionally provided in person by dietitians. The government’s target rate for implementation of specified health guidance in 2023 is 45% (versus an implementation rate of 18% in 2016). Incentives aimed at encouraging more people to take up specified health guidance include diversifying the guidance requirements (e.g., shorter guidance period, use of ICT, model programs, etc. ), setting incentives for insurance societies, and starting distribution of health scoring reports. DietPlus is a personal dietary guidance service to help people eat properly and lose weight in a healthy manner. It leverages a network of nationally licensed dietitians. DietPlus consists of a business providing services for health insurance societies and companies, a media business (distributing contents emphasizing the importance of proper diet in losing weight and advertising on the website and app to draw customers to the app or to actual stores), and a consumer diet business (provides consumers customized dietary guidance from a personal dietitian, either in person or through an app). With DietPlus, the company aims to help control rising medical costs in Japan by providing preventative medical treatment to ward off lifestyle diseases or stop them from becoming more serious. For health insurance societies and companies, the cost of specified health guidance services (health guidance given to individuals assessed as requiring lifestyle changes due to a high number of risk factors for metabolic syndrome) per member or employee is typically 20,000–40,000 yen. Face-to-face consultations for consumers are priced at 62,800 yen for two months or 152,000 yen for six months (both excluding tax). For services provided through an app, a one-week trial costs 3,900 yen, a four-week course 12,000 yen, and an eight-week course 23,400 yen (all excluding tax). MedPeer plans to expand the scope of its specified health guidance service by harnessing its dietitians platform, because physicians prioritize diet in preventative healthcare, and dietitians are more effective at dietary guidance than doctors. MedPeer plans to reduce the workload of insurance societies and business operators through the use of IT, and increase service levels through measures such as affiliated support programs for people with severe diseases. It also intends to devise a system for recruiting and training licensed dietitians. MedPeer plans to build a lifelog platform that enables personalized, one-to-one marketing based on lifestyle records by deploying Mediplat’s lifelog apps centered on diet and exercise (records the number of steps walked) to partner companies. 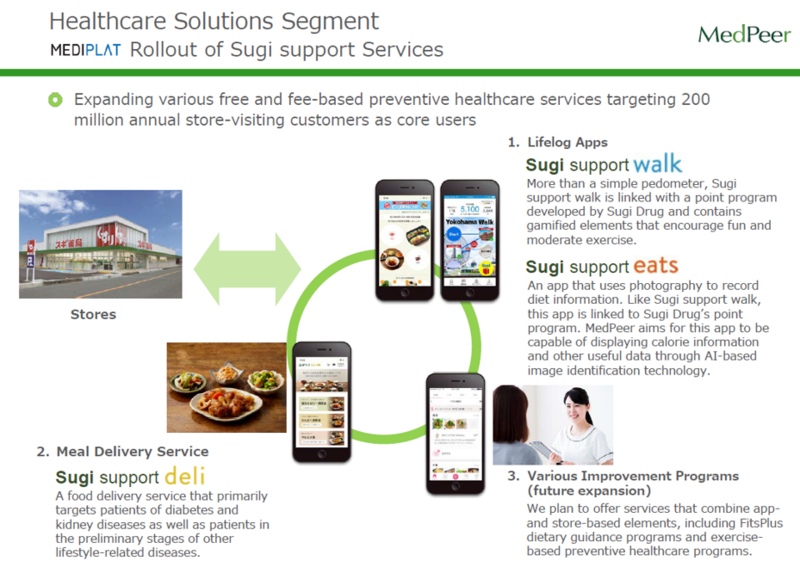 These apps have been introduced at Sugi Pharmacy stores (Sugi Support Deli, Sugi Support Eats, and Sugi Support Walk). The service will be offered at all Sugi stores starting in March 2019. Although the product is currently provided via OEM, Sugi Pharmacy says it will consider in-house production if the nationwide rollout is successful. MedPeer also plans to build up its database by taking advantage of the offline incentives offered by Sugi Support Eats and Sugi Support Walk (users collect points that can be redeemed in stores by recording what they eat and how many steps they have walked). MedPeer expects synergies between online and offline elements, because the alliance with Sugi Pharmacy allows it to avoid issues facing online companies without physical stores. MedPeer’s key weakness in its healthcare solutions business is its low brand recognition amongst consumers for its “First Call” and DietPlus target consumers and companies servicing consumers, which would limit its expansion potential from the present B2B to B2C field. In B2C, Welby (TSE: 4438) provides its smartphone app to medical institutions who ask patients to record health information in the app and share that data for treatment and Welby receive usage fees. MedPeer’s mission has been inspiring and distinguishes it from most social media platforms. Established in Dec 2004 by Dr. Yo Iwami and listed on TSE Mothers in June 2014, Dr. Iwami still works on the ground as a cardiologist physician once a week. 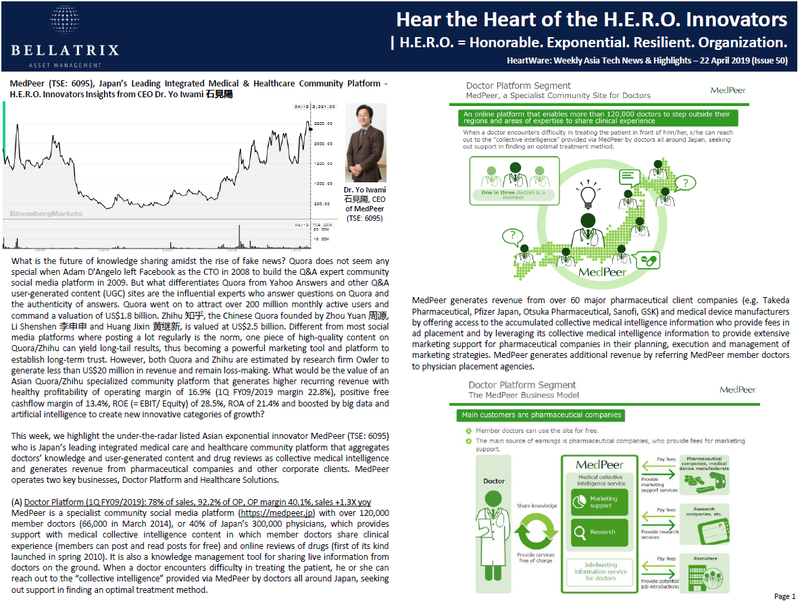 Thus far, of the 69 entrepreneurs and CEOs whom we had highlighted in our weekly research brief HeartWare, around one-third are in our focused portfolio of 40 HERO Innovators, while the rest are in our broader watchlist of 200+ stocks. Our emotional labor of love over the past months in sharing openly our research ideas (to battle-test our ideas by critiques and avoid blindspots in investing) and setting up the proper regulated and transparent UCITS fund structure to protect investors’ interests has deepened our conviction for the positive change that we will make together with H.E.R.O. – and we are now in the final stage of giving birth in April/May 2019 to H.E.R.O., the only Asia SMID-cap tech-focused fund in the industry and guarding investors’ interests in the regulated UCITS fund structure with daily NAV & daily liquidity and no exit fees. “Since our establishment in December 2004, we have developed our business in accordance with our mission of ‘Supporting Doctors, Helping Patients.’ In August 2007, we launched MedPeer, a doctors-only membership community. The community amasses the experience and knowledge of individual doctors into a nationwide network—a “collective medical intelligence.” We operate this community in the aim of enhancing the quality of healthcare throughout Japan. We will harness the energy of all members of the Group to achieve further growth. At the same time, we will continue to aggressively pursue alliances, such as our business and capital alliance with Sugi Holdings (TSE: 7649)”, comments Dr. Yo Iwami, founder and CEO of MedPeer (TSE: 6095). “On 4 April 2019, the number of implementation of specific health instruction of FitsPlus surpasses 30,000, up 3.2X in three years. Specific health guidance targets those who are judged to have a high risk of developing lifestyle-related diseases and can expect a preventive effect by improving lifestyle habits as a result of the specific medical checkup for people aged 40 to 74. Specialized staff such as dietitian and public health nurse support revision of lifestyle. The number of people targeted for specific health guidance is increasing year by year, but the implementation rate remains at 19.5%. In the specified health guidance service provided by MedPeer, a registered dietitian acts as a dedicated trainer to promote improvement of eating habits, thereby helping to improve test values. Based on the concept of ‘eat properly’, it is characterized by helping each other to develop a proper eating habit. We also work with our business sites to achieve an improvement in the implementation rate. (1) Education support of MR for pharmaceutical companies: Along with the spread of generic drugs, the shift from primary to specialty development for new drug development, and the introduction of regional comprehensive care systems, there is a need for changes in the role of MRs and the way information is provided. Under these circumstances, ‘HR for MR’, which utilizes the collective intelligence of MedPeer doctors, will be developed for pharmaceutical companies. Specifically, AI analyzes all human resource data of each pharmaceutical company, enabling the setting of new MR evaluation indicators and prediction of active human resources. In addition, AI learns excellent MR findings from in-house and analyzes word-of-mouth data on medicines from doctors submitted to MedPeer to provide doctors with ‘what kind of communication method’ and ‘what kind of information’. The AI will coach you and provide ability development support. AI learns the know-how including tacit knowledge of high performers and sends a video of an education target person. (2) Mental health support for employees of First Call clients: The mental health problems of employees are on an increasing trend, according to the Ministry of Health, Labor and Welfare, and the importance of measures in health promotion and prevention of employees in companies is increasing. Under such circumstances, the mental health of employees can be analyzed by ‘HR-kun’ which performs AI analysis by combining health consultations from employees who are sent to ‘First Call’ with health checkup, stress check, and labor data such as attendance. We predict health condition automatically and prevent the aggravation by prompting measures as needed. It can be used for prevention, relapse prevention, reinstatement support, etc. Also, the AI will learn the accumulated data on consultations and responses, and AI will automatically present to physicians an example of responses according to the content of the consultation, enabling doctors to improve their response speed and quality.